The vendor landscape of the global rockets and missiles market features a significantly consolidated nature, with only a handful of companies collectively holding a massive share in the market, observes Transparency Market Research in a recent report. The leading four companies in the market, namely Lockheed Martin Corp., Northrop Grumman Corp., Thales Group, and Raytheon Co. together accounted for over 65% of the market in 2016, commanding dominance with the help of innovative and technologically advanced products, vast pools of financial resources set aside for R&D purposes, and long-term contracts. As competition continues to intensify, leading vendors are putting more emphasis on strategic collaborations, mergers, and acquisitions to expand their product portfolios and geographical outreach. More focus is also being put on R&D activities to introduce technologically advanced products at a steady pace. 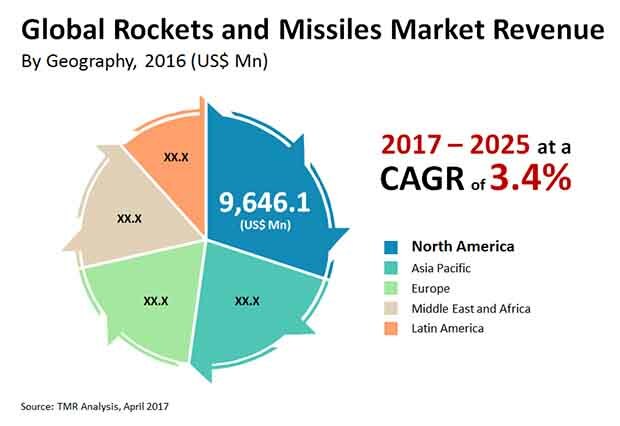 According to the report, the global rockets and missiles market will exhibit a CAGR of 3.2% from 2017 and 2025, rising to a revenue opportunity of US$43.01 bn by 2025 from a revenue valuation of US$32.10 bn in 2016. Of the key varieties of rockets in the market, the segment of artillery rockets presented the most lucrative business prospects in 2016. Highly acclaimed for their ability to destroy a multitude of weapons such as naval ships, tanks, submarines, and armored vehicles, artillery rockets are likely to remain one of the leading varieties of rockets in the global market over the report’s forecast period as well. Geographically, the rockets and missiles market in North America is presently the leading revenue contributor to the global market. Holding a nearly 30% of the overall market in 2016, the regional market commanded dominance chiefly owing to the presence of the world’s most prominent names in the field of rockets and missiles and the high defense budget of the U.S. Over the forecast period as well, the region is expected to retain its dominance owing to the steady rise in defense budgets in key economies. Of the number of factors working favorably for the global rockets and missiles market, the steady rise in defense budgets of developed as well as emerging economies globally has remained one of the most prominent ones over the past few years. As countries continue to plough more finances into their defense sectors, strengthening their artilleries to prepare themselves against the rising numbers of terrorist attacks, the uptake of advanced rockets and missiles has also increased. Other factors driving the market include fast-paced advancements in supporting technologies, rising number of companies foraying into the market, and the vast rise in R&D activities aimed at the development of technologically advanced products. However, the market could be hindered owing to the high costs of new product varieties and concerns related to the potential malfunction of launchers.